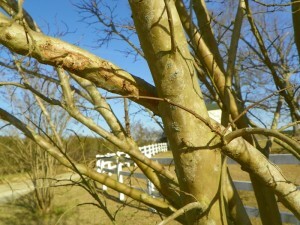 How Do I Prune Crape Myrtle? 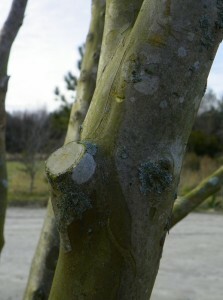 This type of incorrect pruning is often referred to as ‘Crape Murder’. 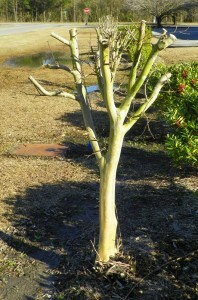 Too often crape myrtles are cut back to bare trunks in the belief this abuse will yield more flowers. In reality this type of severe pruning results in a shorter bloom time, delayed flowering, weaker branching, and can increase insect and disease problems. 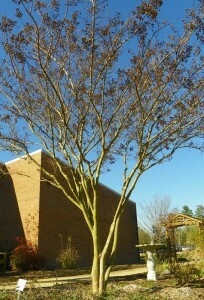 This practice, known as topping, is harmful to all trees and is never the right way to prune a crape myrtle. Other summer flowering trees and shrubs that should be pruned in February include roses, butterfly bush, and chaste tree. Learn more about pruning ornamental plants from the N.C. Cooperative Extension publication, Pruning Trees and Shrubs.